Description: This book is the result of 15 years of research on the ancient Hebrew relative clause as well as the effective application of modern linguistic approaches to an ancient language corpus. 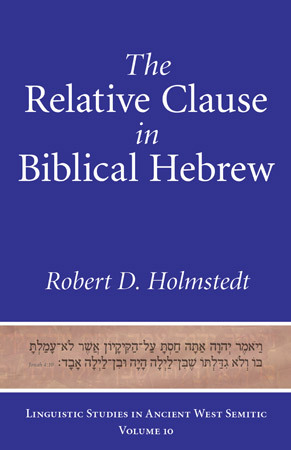 Though the ostensible topic is the relative clause, including a full discussion of the various relative words used to introduce Hebrew relative clauses and a detailed presentation of the relevant comparative Semitic data, this work also carefully navigates the challenges of analyzing a �dead� language and offers a methodological road map for the analysis of any feature of Biblical Hebrew grammar. With the appendixes of relative clause data, including the author�s English translations, the work aims at comprehensiveness, exhaustiveness, and full transparency in data, method, and theory. Citation: Frank H. Polak, review of Robert D. Holmstedt, The Relative Clause in Biblical Hebrew, Review of Biblical Literature [http://www.bookreviews.org] (2017).